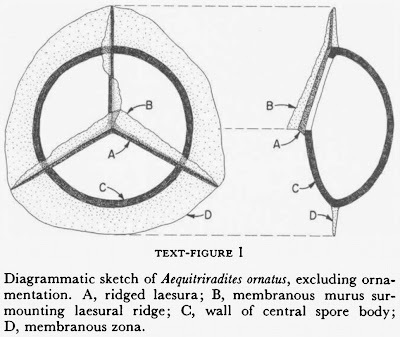 Diagram of Aequitriradites ornatus, from Upshaw (1963). The Cretaceous period is best known in popular culture as the time of Tyrannosaurus and Triceratops, of Pteranodon and Quetzalcoatlus, of Elasmosaurus and mosasaurs. But it was also, in an arguably even more significant way, the time of Aequitriradites. Aequitriradites is the fossil represented in the diagram at the top of this post. It is not very large: at its largest, the species shown above is about a tenth of a millimetre across (Upshaw 1963). It is, in fact, the spore from a liverwort. The vegetative parts of liverworts mostly do not have much of a fossil record, being soft and prone to decay, though long-time readers may recall a suggestion that this spotty fossil record was occasionally dramatic (alas, general opinion seems to have not been swayed). However, their spores are more resistent, and hence may be abundant as fossils. Because it is rarely possible to tell exactly which plant they came from, fossil spores (and pollen) are classified as form taxa, parallel to the classification of other plant fossils. Aequitriradites species are characterised by a membranous flange (a zona) running around the outside of the spore, together with a triradiate laesura pattern (the fissures that mark where the spore opens when it germinates) on one face. Depending on the species, the laesurae may be well-marked or faint. There may also be an opening in the spore wall at the apex of the face opposite the laesurae (Cookson & Dettmann 1961). It has been suggested that the otherwise unidentified liverworts that produced Aequitriradites spores were probably related to the modern liverwort order Sphaerocarpales, and Archangelsky & Archangelsky (2005) compared Aequitriradites to the spores of the aquatic genus Riella. Alternate faces of specimens of Aequitriradites plicatus, from Archangelsky & Archangelsky (2005). The abundance of plant spores and pollen is such that they are commonly used as 'index fossils', indicators of the age of the rock they are found in. Aequitriradites contains various species throughout the Cretaceous period (species assigned to this genus from the Triassic seem to have since been re-classified). Li (2014) identified the appearance of Aequitriradites spinulosus in the very latest Jurassic as one of the better indicators of the start of the Cretaceous period in the Qinghai-Xizang Plateau in China. Aequitriradites species seem to have been most abundant in the Early Cretaceous, becoming rarer in the Late Cretaceous. Establishing the latest appearance of a spore taxon in the fossil record can be difficult, because of the possibility of re-working (fossil spores being disassociated from their original deposit and re-buried in a later one), but non-reworked examples of Aequitriradites in the latter part of the Late Cretaceous were alluded to by Askin (1990). TLDR: If you've got Aequitriradites, you've got Cretaceous. Archangelsky, S., & A. Archangelsky. 2005. Aequitriradites Delcourt & Sprumont y Couperisporites Pocock, esporas de hepáticas, en el Cretácico Temprano de Patagonia, Argentina. Rev. Mus. Argentino Cienc. Nat., n. s. 7 (2): 119-138. Askin, R. A. 1990. 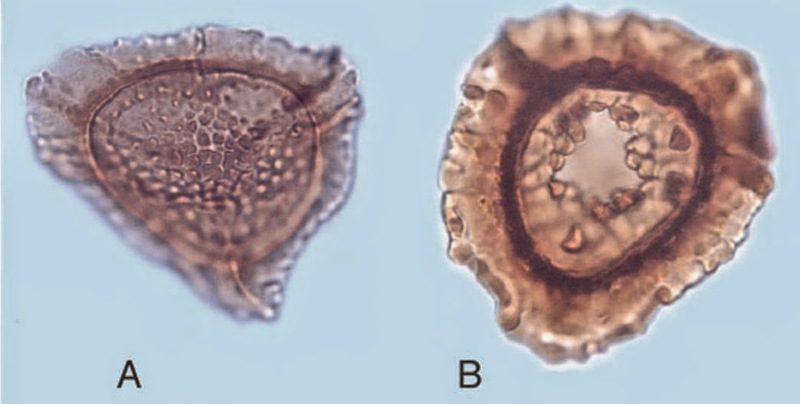 Cryptogam spores from the Upper Campanian and Maastrichtian of Seymour Island, Antarctica. Micropaleontology 36 (2): 141-156. Cookson, I. C., & M. E. Dettmann. 1961. 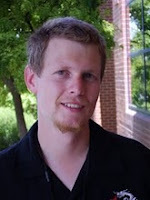 Reappraisal of the Mesozoic microspore genus Aequitriradites. 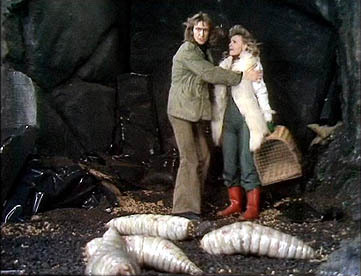 Palaeontology 4 (3): 425-427, pl. 52. Li, J. 2014. Upper Jurassic and Lower Cretaceous palynological successions in the Qinghai-Xizang Plateau, China. In; Rocha, R., et al. (eds) STRATI 2013, pp. 1197-1202. Springer Geology. Upshaw, C. F. 1963. Occurrence of Aequitriradites in the Upper Cretaceous of Wyoming. Micropaleontology 9 (4): 427-431. Xizang is better known to Westerners as "Tibet", and the plateau as the Tibetan Plateau (it's partly located in Qinghai, but then much of Qinghai was historically part of Tibet). Thanks Andreas; I knew that Xizang was Tibet, but I wasn't sure if it was the Tibetan Plateau being referred to or somewhere nearby.